The entrances and exits to your building are not only a means for people to get in and out of the structure, they are also a way to regulate your heating and cooling systems, the flow of traffic and of course, your building’s security. In short, the doors to your building are a means of control and overlooking their importance can cost you thousands of dollars each year or even put the safety and integrity of the occupants inside in danger. Revolving doors allow you more control over your entrances and exits plus they bring significant cost savings to the table. Any door that rotates on a central axis in a cylindrical enclosure and has three, four or five separation panels (called ‘wings’ or ‘leaves’) hinged on the central axis is a revolving door. Here’s why they demand serious consideration for your structure’s entrance. Perhaps the most obvious of these controls is the flow of traffic that is going in and out of your building each day. Revolving doors make it easier for people to move in and out en masse without causing bottlenecking or long lines outside your door. Revolving doors can also be automatic, making it easier for the occupants of the building to enter and exit even if their hands are full; they have strollers or are in wheelchairs. A major misconception about revolving doors is that they are always “open.” In fact, that couldn’t be much farther from the truth. 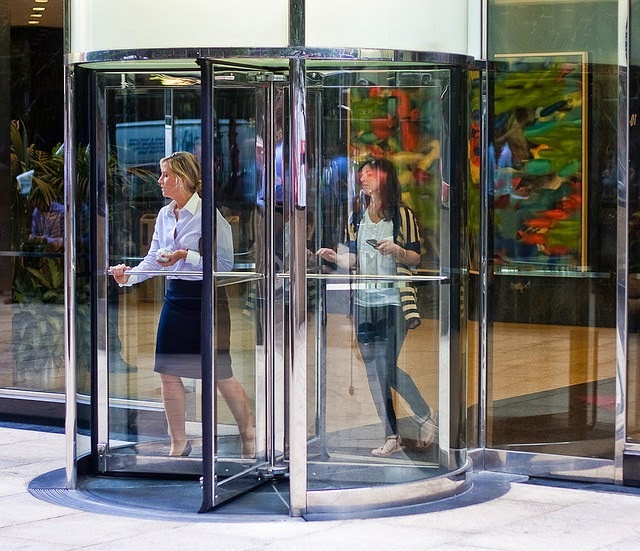 Revolving doors are 100% lockable and controllable, meaning that at night—or any time during the day that the need arises—you can shut down the entrance to your building much more effectively than a standard swinging door. In the instance of security, a thief knows a lot more about getting into a locked standard door than a locked revolving door, mainly because they encounter the former on a daily basis. Revolving doors can also be locked from inside offering no way for a prowler or thief to physically access the lock. Further, revolving doors don’t have to be “two way” streets like standard doors are. You can have a one-way revolving door to better control the security of the building, meaning people can enter but not exit. These are very popular in airports where security is a big deal. Even when the doors are accessible, they provide one huge security benefit—you can control the amount of “tailgating” that takes place. With standard doors, it’s easy for an authorized individual to enter the building (by whatever secure means you have in place e.g. swipecard, biometric scanner, etc. ), but it’s also easy for another person to simply walk in behind them, or “tailgate” them. Of course, revolving doors are also always closed, even when they are open—standard doors are either open or closed. This is because a revolving door has multiple door panes which create compartments through which the occupants of the building must pass to enter or exit. As the door revolves, a seal is created in each individual section of the door, meaning that the inside and the building’s air and the outside of the building’s air never actually meet. • Heating and cooling bills will go down since the airlock seal prevents heat from escaping during the cooler months and entering during the hotter months. This creates a more efficient control for your environment, one that is both pleasant to be in and easier on the building’s budget. • If a building has an elevator, the “chimney effect” is a big concern. The chimney effect is when drafts from the outside at street level are pulled into the building, travel up the elevator shafts at increasingly high speeds and then burst through the vents at the top of the building. This puts strain on the elevator’s motor, creating a dangerous situation for passengers as well as more costly repairs. The vents on the roof also suffer greater wear and tear and can be damaged during the process. • Noise and air pollution from the street is greatly reduced when revolving doors are in place. This is once again thanks to the airlock created by the revolving wings. This creates a more environmentally and mentally healthy atmosphere inside of the building. What Types of Buildings Use Revolving Doors? The bottom line is that your building should consider installing revolving doors for monetary, security and health purposes. This is why so many offices, airports, hospitals, hotels, malls, stations, venues, banks, apartment buildings and museums have them. Author Bio: This guest article is a work of Glen Quinn from Advance Access Control Solutions specializing in access control systems, revolving doors, turnstiles and car park entry systems.